droneDyne is happy to annouce that it is back in business! How many drones including the autonomous plane do you see in this picture? Hint: there is a tiny CX10 on the left. -On its left : dD Quad 16, first prototype of a long range long autonomy drone, still used for testing purposes. 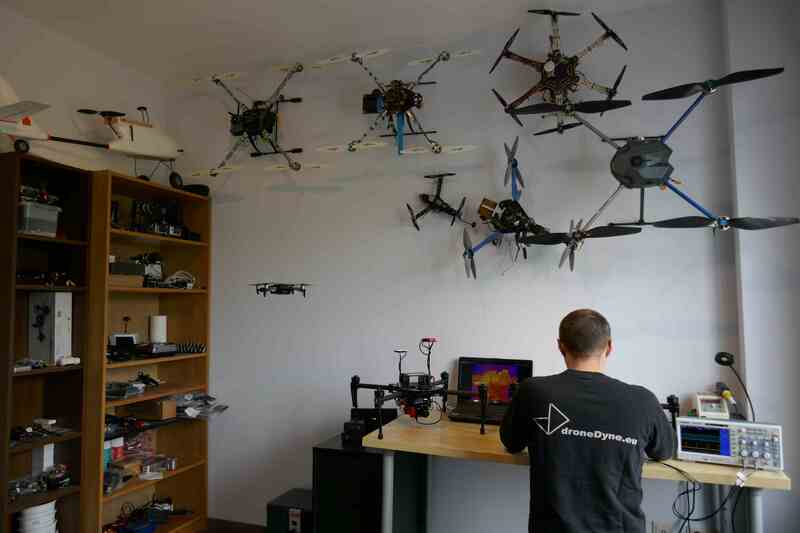 -Top left : dD Quad 18, a long range, long autonomy drone that was used to perform several aerial footage using a Panasonic GF1 (can be seen in its gimbal on the shelf). -The big one on the right : dD Quad 20 is designed to replace the dD Quad 18. It is foldable, there is a great clearance for the camera and the landing gear is retractable to allow 360° video shoots. -The small tricopter : Trifecta, is a racing drone on ardupilot with GPS, it combines racing features with the possibility to use it to take aerial photos or videos using a RunCam 2 or a GoPro without gimbal. -The one that is flying : Mavic Air, my second DJI drone is meant to be used as my travelling drone for now replacing the 3DR Y6. -The plane on the top left : Skywalker, flies on ardupilot and was used for a solar plane project. -On the desk : Two Matrice 100 built for clients, one is designed to inspect crop fields with a multi spectral camera and a FLIR Vue PRO, the other one is mounted with a DJI Z3 camera. -Hubsan X4 and CX-10 on the left shelf.